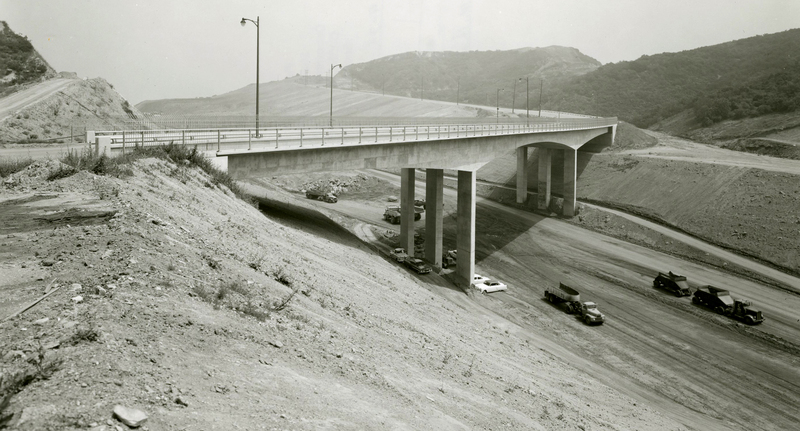 In this 1960 photograph, Sepulveda Bl snakes north toward Mulholland Dr Bridge. The earth embankment below the bridge was moved for the freeway. Photograph Courtesy of California Department of Transportation. 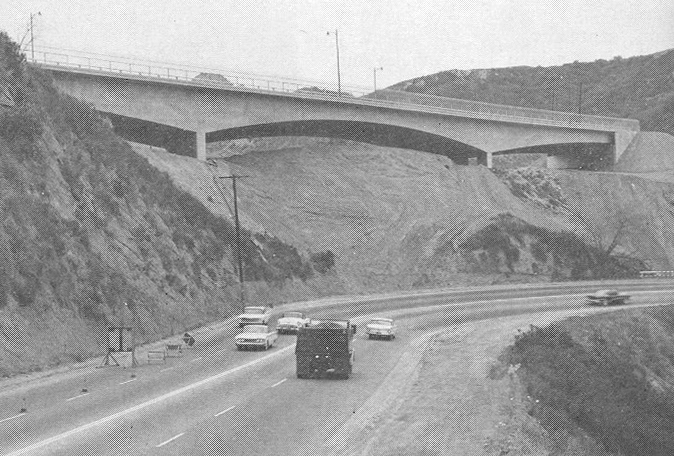 On Monday, April 4, 1960, the same day the 1959 Academy Awards were held at RKO’s Pantages Theatre in Hollywood, Peter Kiewit Sons Co. completed a bridge across the Sepulveda Pass. Mulholland Dr Bridge nears completion. 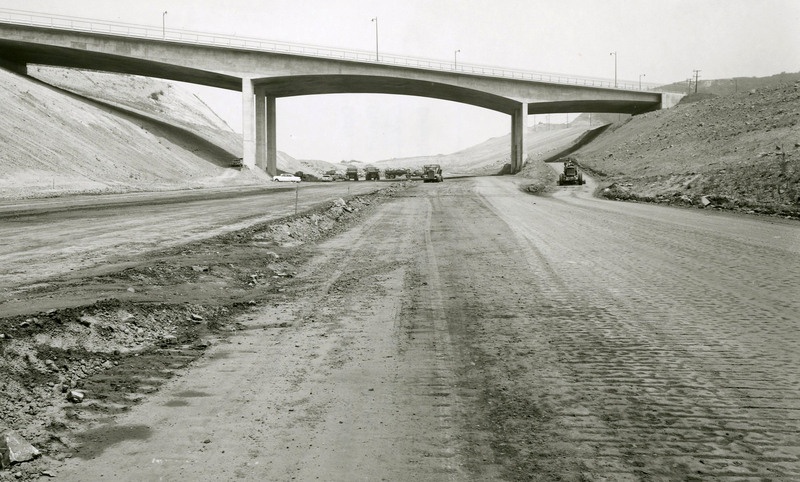 The San Diego Freeway will come approximately two years later. Photograph Courtesy of California Department of Transportation. Ben Hur, still considered a landmark film, won the Best Picture award that year. The new Mulholland Drive Bridge received fewer headlines. After all, the bridge overlooked an undeveloped canyon. No freeway ran beneath it. No rapid route between West Los Angeles and the San Fernando Valley existed. Now renamed Kiewit Infrastructure West, the contractor that built Mulholland Drive Bridge will be demolishing it. The San Diego Freeway that carried 100,000 vehicles per day at Olympic Bl in 1965 now carries more than 300,000 vehicles each workday, making it one of the busiest freeways in the United States. The Sepulveda Pass I-405 Improvements Project will add a high-occupancy vehicle (HOV) lane to a 10-mile stretch of the northbound freeway, creating the nation’s longest continuous HOV corridor, continuing a long tradition of channeling vehicles through the Sepulveda Pass to join Los Angeles with its northwestern neighborhoods. It is a long history. Looking north toward the San Fernando Valley, the photographer captures the unfinished Mulholland Dr Bridge. Photograph Courtesy of California Department of Transportation. The main portion of Mulholland Drive—westward from the Cahuenga Pass in Hollywood past the Sepulveda Pass—opened in 1924 under a different name: the Mulholland Highway. It was built by a consortium of Hollywood Hills landowners. Their goal was to bring development to the Hollywood Hills and make a few dollars for themselves. They could not have known that Mulholland Dr would come to symbolize Los Angeles in films and songs, such as David Lynch’s Mulholland Drive and Tom Petty’s Free Fallin’. Road-level view of Mulholland Dr Bridge. Mulholland Dr was moved 1.1 miles south to meet the new bridge. Photograph Courtesy of California Department of Transportation. Even the road’s name evokes Southern California history. Mulholland Drive (and Mulholland Highway) are named after engineer William Mulholland, a giant in Southern California history for his role in bringing distant water to chronically thirsty Los Angeles in 1913. With Mulholland’s aqueducts feeding Los Angeles, its population exploded. Consequently, in May, 1958, the State Division of Highways—this preceded the creation of Caltrans—called for bids on a $10-million highway construction project. 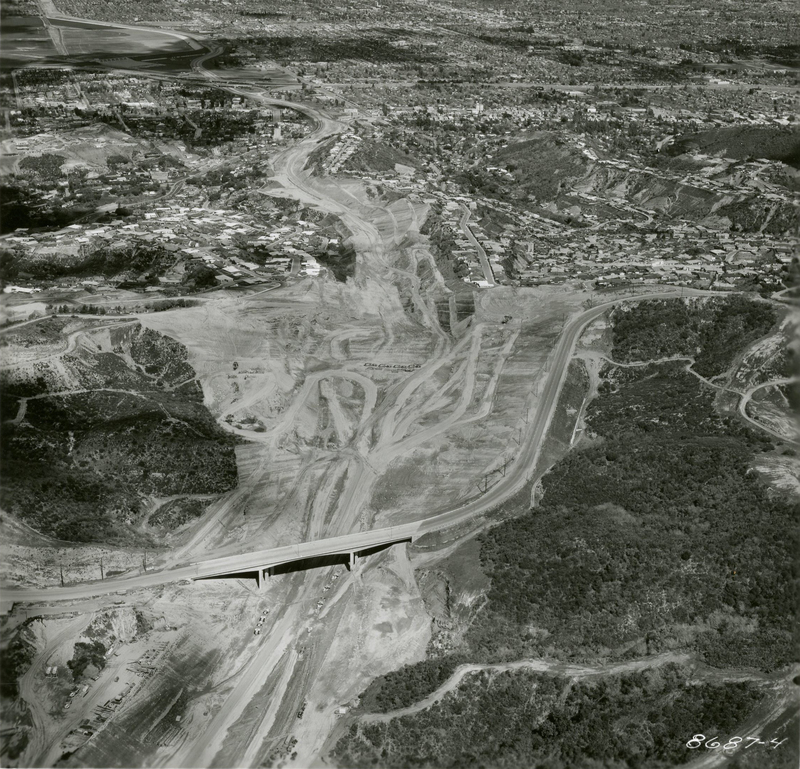 Besides closing a 4.1-mile gap in US-101 and funding other work on the San Diego Freeway, the 1958 contract required the relocation of 1.1 miles of Mulholland Drive south. The Los Angeles Times called it “a mammoth project.” Once moved, Mulholland Drive would cross a new 579-foot-long bridge: Mulholland Drive Bridge. When completed, relocating Mulholland Drive and building Mulholland Drive Bridge cost $1,824,000. In June 1960, bids were opened for a $14-million contract to extend the San Diego Freeway 7.4 miles from Brentwood to Valley Vista Bl in the San Fernando Valley. Mulholland Drive Bridge would finally span a freeway. In a production reminiscent of a Hollywood sequel, the Mulholland Drive Bridge will be demolished and reconstructed to accommodate the widening of the I-405 freeway. The new bridge will be widened by approximately 10 feet and designed to the latest seismic standards.